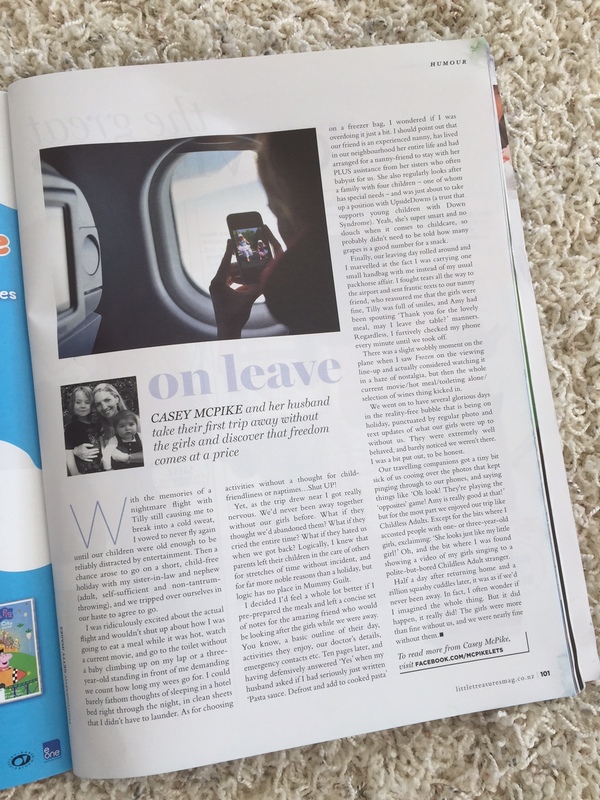 With the memories of a nightmare flight with Tilly still causing me to break into a cold sweat, I vowed to never fly again until our children were old enough to be reliably distracted by entertainment. Then a chance arose to go on a short, child-free holiday with my sister-in-law and nephew (adult, totally self-sufficient and non-tantrum-throwing), and we tripped over ourselves in our haste to agree to go. I was ridiculously excited about the actual flight and wouldn’t shut up about how I was going to eat a meal while it was hot, watch a current movie, and go to the toilet all alone without a baby climbing up on my lap nor a three year old standing in front of me demanding we count how long my wees go for. I could barely fathom thoughts of sleeping in a hotel bed right through the night, in clean sheets that I didn’t have to launder. As for choosing activities without a thought for child-friendliness or naptimes…Shut UP! Yet as the trip drew near, I got really nervous. We’d never been away together without our girls before. What if they thought we’d abandoned them? What if they cried the entire time? What if they hated us when they got back? Logically I knew that parents left their children in the care of others for stretches of time without incident, and for far more noble reasons than a jaunt off on holiday, but logic has no place in Mummy Guilt. I decided I’d feel a whole lot better if I pre-prepared the meals and left a concise set of notes for the amazing friend who would be looking after the girls while we were away. You know, a basic outline of their day, activities they enjoy, our doctor’s details, emergency contacts etc. Ten pages later, and having defensively answered “yes” when my husband asked if I had seriously just written “Pasta sauce. Defrost and add to cooked pasta” on a freezer bag, I wondered if I was overdoing it just a bit. I should point out that our friend is an experienced nanny, has lived in our neighbourhood her entire life, and had arranged for a nanny-friend to stay with her PLUS assistance from her sisters who often babysit for us. She also regularly looks after a family with four children – one of whom has special needs – holds a Master’s Degree, and was just about to take up a position with UpsideDowns (a trust that supports young children with Down Syndrome). Yeah, she’s super smart and no slouch when it comes to childcare, so probably didn’t need to be told how many grapes is a good number for a snack. Finally, our leaving day rolled around, and I marvelled at the fact I was carrying one small handbag with me instead of my usual packhorse affair. I fought tears all the way to the airport, and sent frantic texts to our nanny friend, who reassured me that the girls were fine, Tilly was full of smiles, and Amy had been spouting “thank you for the lovely meal, may I leave the table?” manners. Regardless, I furtively checked my phone every minute until we took off. There was a slight wobbly moment on the plane when I saw ‘Frozen’ on the viewing line-up and actually considered watching it in a haze of nostalgia, but then the whole current movie/hot meal/toileting alone/selection of wines thing kicked in. Some time later I informed the (alarmed-looking) hostess that I’d just had the best sleep for the longest number of consecutive hours in over a year. We went on to have several glorious days in the reality-free bubble that is being on holiday, punctuated by regular photo and text updates of what our girls were up to without us. The little monkeys were extremely well behaved, and barely noticed we weren’t there. I was a bit put out, to be honest. Our travelling companions got a tiny bit sick of us cooing over the photos that kept pinging through to our phones, and saying things like “oh look! They’re playing the ‘opposites’ game! Amy is really good at that!” but for the most part we enjoyed our trip like Childless Adults. Except for the bits where I accosted people with one or three year old girls, exclaiming: “she looks just like my little girl!” Oh, and the bit where I was found showing a video of my girls singing into a fan to a polite-but-bored actual Childless Adult stranger. Um, and there was a trip to a Disney Store where I audibly sang along to ‘Let It Go’ and had to be talked down from filling my arms with merchandise via murmurs from my husband of “luggage allowance” and “credit card limit”. Half a day after returning home and a zillion squashy cuddles later; it was as if we’d never been away. In fact, I often wonder if I imagined the whole thing. But it happened, it really did! The girls were more than fine without us, and we were nearly fine without them. Next PostChildren’s books. The dark, desperate, hidden meanings.